Every reader knows how powerful books can be; some books bring us joy and delight, others teach us to see the world differently, and there are some that terrify and astound - they all change our lives in some way. These are just a very small selection of books that resonated with me personally and in their individual ways, altered the way I view the world. It's not the best book on minimal living but it's what kick started my passion for it. Enough is about how, when we like something, we chase it; we want more, more of everything - more food, more status, more money, more stuff - without stopping to think about whether it's making us happy. Overabundance is at the heart of this book, how we strive for more despite it making us tired, sick, frustrated, and in debt. John Naish demonstrates how, despite being our culture encouraging us to seek more, we are responsible for this problem and we can break the cycle. Naish provides practical ways to live a better life with enough and it's something I have been passionate about ever since reading his book. In Cold Blood is a true crime story about the murder of a family and the investigation that led to the execution of their killers. It's a cold, chilling case with no motive and very few clues; it's a brutal crime told with extensive detail through eloquent prose and engaging dialogue. Trueman Capote conducted personal interviews with Smith and Hickock, the killers, and In Cold Blood was not completed until after the trial and execution. This book is responsible for my morbid curiosity and interest in true crime. I've been vegetarian since a very young age and switched to a plant-based diet over ten years ago so this book didn't change my opinions on eating animals and consuming their by products, but it did reinforce my values and ethics. What it did do, however, is show me that things don't have to be black and white, there are many fine lines to walk and ethical decisions are very personal. Eating Animals changed my life because it reinforced my life choices but also encouraged me to think independently of the lifestyle "rules" that so many vegans impose upon themselves as if they were laws. 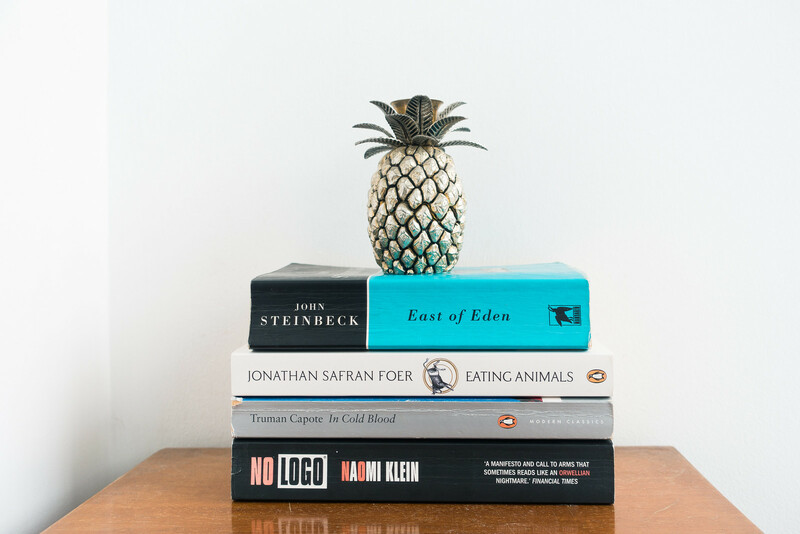 It's a gentle book that takes fair approach to discussing omnivorism and veganism; it's not at all preachy or condescending, and Jonathan Safran Foer presents a balanced argument from all points of view. It's an important book I believe everyone should read and it could change your life. House of Leaves is unlike any book I have ever read, it affected me mentally and physically as I explored the pages and you truly do explore the pages when you read it. Full of coloured text, highlighted boxes, pages that require you to turn and twist them; there are vertical footnotes and numerous appendices with fiction being presented as fact and a mystifying story that terrifies and disturbs the reader. House of Leaves drags you into a story that is completely different to any other, you're drawn into a world where you feel things you never thought a book could make you feel - claustrophobia, disorientation, fear and anxiety. The story is simple but the book is not; I wrote a full length review if you're interested in reading it, and I encourage you to do so - but not with a faint heart. I studied media, popular culture, marketing, and branding at university and I've always had an obsession with advertising, No Logo served to reinforce and encourage that obsession. No Logo lifts the veil on the insidious practices and effects of corporate marketing both on the product line and its consumers. It's a pioneering piece of cultural criticism, discussing money, marketing, mass consumerism and the anti-corporate movement, that challenges, enlightens, and inspires. Although released in 2002, No Logo remains an important read especially for anyone interested and branding and brand identity; although I believe it's a must-read for all as it opens our eyes to how products for the mass market are made, branded, sold, and marketed to consumers with intentional manipulation of its consumers. I hated this book when I read it; when I reached the final pages I felt cheated, I had bought into the story only to have it ripped out from underneath me and everything I thought I knew about the events which unfolded was no longer true... and then I discussed the book with others and read enlightening reviews. I realised how powerful a story Life of Pi was. The book made me realise the magic of storytelling, I absolutely fell in love with it; the story, the characters, the message. It's often mistake for a book about religion when it's really a book about believing in something; it's a book with a message that life is how you choose to see it. Life of Pi changed my life because it reinforced my positive outlook on the world, seeing the world full of possibilities and magic - if only we choose to see it. This book broke my heart, the story has stuck with me hard and fast. I find myself thinking about it often and I read it years ago. It's a sprawling tale about two families, poisonous rivalry, identity, endurance, and love; the characters are powerful and diverse, the story is captivating. East of Eden explores sin, good intentions, and judgment; it's a testament to how all our mistakes and triumphs are caused and created through our own actions - we are responsible for the things we do. It's a beautiful and heartbreaking story, an absolute must-read and it absolutely changed my life. Although the Brothers Grimm are widely considered to be the fathers of children's fairy tales, they not only didn't write the original stories, they weren't originally intended for children either. However, that's how many of us grew up, with Brothers Grimm being synonymous with the stories of Cinderella, Snow White, and Rapunzel, and that's where my love for folklore and fairy tales began. For me, these tales encouraged my imagination and interest in storytelling. I've become besotted with folklore and learning about the history of other cultures especially ancient fables and particularly Greek mythology. I've become an avid collector of vintage books on fairy tales and I'm slowing building a collection of Folio Society books.